In the past few years there has been an increasing demand for coconut water, and rightfully so! Coconut water is an excellent alternative for people who tend to be health conscious, and prefer flavored drinks over water. You might be wondering where this tropical beverage comes from; coconut water is the sweet, clear liquid that fills young, green coconut shells. Coconuts mature over approximately twelve months, however the highest concentration of water is found in the shells that have matured over five or six months. This is because as time passes, more and more of the water is used in the development of the thick, white flesh of a mature coconut- which is what is used to make coconut milk. Unlike the milk, coconut water has a more mild, sweet smell and flavor. Not only is the sweet taste of coconut water a great alternative to plain tasting water, but this tropical beverage has the proper balance of natural sugars, amino acids, and minerals to keep you hydrated throughout your day. In fact, coconut water is so good at hydrating that it is being seen as today’s ‘natural’ sports drink. With a variety of minerals- such as potassium, magnesium, and sodium- coconut water is similar to other major sports drinks AND has the added benefits of containing no artificial sweeteners, artificial flavors, or added fructose or maltose. It also has a lower amount of salt than found in your average sports drink; yet one study concluded that coconut water rehydrated healthy young athletes just as effectively as the sports drinks did. Automated Food and Beverages is proud to carry coconut water as an alternative and healthy, thirst-quenching option. 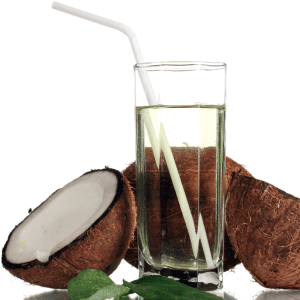 It is a great beverage of choice for coconut lovers and gym fanatics alike!